To offer mobile health consultancies, the pool of entrepreneurs are implementing the app based services and solutions. For instance, apps such as TouchCare and iBluebutton enable the users to use the power of accessibility with ease as the concept of telemedicine isn’t anything new but having the accessibility to the doctor is a new thing. Telemedicine is changing the healthcare landscape by building stronger relationship between the patient and doctor and also reduces the complexity of interdependence of various industries. Goldstein Research analyst forecast the telemedicine market size is set to reach USD 56.7 billion by 2024, at a CAGR of 17.5% over the forecast years. The report covers the present ground scenario and the future growth prospects of the telemedicine market for 2016-2024 along with the number of transactions with value made by end-users in favor of telemedicine and adoption rate in various regions. We calculated the market size and revenue share on the basis of revenue generated from major players in telemedicine across the globe. On the basis of application, dermatology dominated the market with 27% market share in 2016 while neurology is expected to witness the fastest growth at a CAGR of 14.57% owing to increasing neurological complications such as stroke, Alzheimer’s and Parkinson’s incidences. Emergency care and cardiology are the opportunistic telemedicine market. Telemedicine Market Outlook 2016-2024, has been prepared based on an in-depth market analysis from industry experts. The report covers the competitive landscape and current position of major players in the global telemedicine market. The report also includes porter’s five force model, SWOT analysis, company profiling, business strategies of market players and their business models. Global market report also recognizes value chain analysis to understand the cost differentiation to provide competitive advantage to the existing and new entry players. 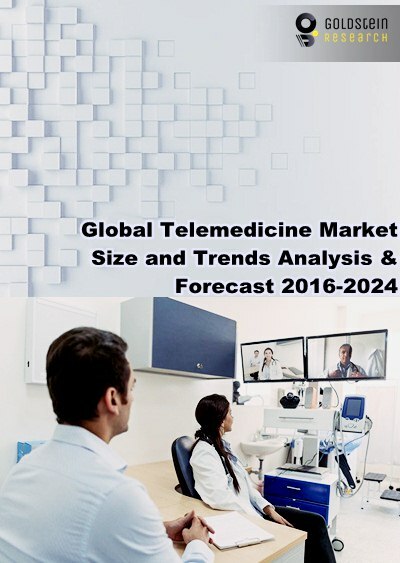 Our global telemedicine market report comprises of the following companies as the key players in the Telemedicine market: F. Hoffmann-La Roche Ltd., CISCO Systems, Inc., Siemens Healthcare, McKesson Corp, Agfa HealthCare NV, AMD Global Telemedicine, Inc., Polycom Corp., Honeywell HomMed LLC, InTouch Technologies, Inc., LifeWatch AG, Medtronic, Inc., OBS Medical Ltd., Allscripts Healthcare Solutions, IBM, Intel Corporation, Philips Healthcare, GE Healthcare, and Cardio Net Inc.
Other high-flying vendors in the market are: Haemonetics Corp., Apollo Hospitals, Maestros Telemedicine, Medisoft Telemedicine Pvt. Ltd., Cloudvisit Telemedicine, Reach Health, and SnapMD Telemedicine Technology, American Well, Doctor on Demand, First Opinion, MDLIVE, Pager, PlushCare, Spruce, Talkspace, Teladoc. According to the report, major driving factor for expansion of telemedicine market is built-in EMR integration that provides the patient information to clinician at the point of care and also to the remote specialist, even when they each use a different EMR during telemedicine consultation. Further, the report states that the major challenge is lack of well-established infrastructure as a dropped connection may not be a huge deal between friends but between a physician and a patient — it could lead to missed instructions and possible patient mismanagement. Based on geography, North America holds the largest market share of 40% in 2016 while APAC is projected to witness a robust growth with a CAGR of 15.1% over the forecast years. China, Japan, Korea, Indonesia, Singapore hold the opportunities for the telemedicine player owing to strong demand for centralization of healthcare administration and increasing population coupled with the rising health awareness among people. What is the total market size by 2024 and what would be the expected growth rate of telemedicine market? What is the adoption rate of telemedicine in various applications in 2015-16 and what would be the expected demand over the forecast period?